Brady Skjei (1st 28th) is the best example of if you go strictly by the numbers then many a Ranger fan thought Skjei had a weak freshman season at Minnesota. They would also be wrong as Skjei was paired with Minnesota's best offensive player last season with the role of being the defensive protector. Yes Skjei had some inconsistent games during the season as he made the jump to NCAA Division 1 hockey but that is to be expected for a young defender. This year, Skjei is be asked to do a little more on the blueline as once again Minnesota will bring a loaded squad to contend for the NCAA title. 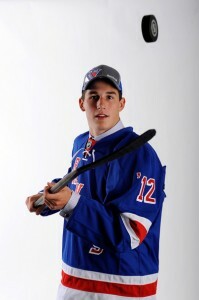 Don't be surprised if Skjei winds up paring with Islander prospect Jake Bischoff (2012 7th) on the blueline. The numbers aren't important to me as I want to see Skjei out on the ice in critical situations with the game on the line for Minnesota. Cristoval "Boo" Nieves (2nd 59th) had a great first half and for the most part a good second half but no goals in his last 11 games. This year "Boo" will need to be one of the team leaders for his Michigan Wolverines as the Wolverines missed making the NCAAs for the first time since the 1989-1990 season. The first question for Nieves has to be which is he, a playmaker or a goal scorer? I say Nieves needs to be the playmaker who chips in enough goals to keep other teams honest. A 45 point season would be a good one for Nieves. Steven Fogarty (3rd 72nd) may have only had a 5-5-10 freshman season for Notre Dame but expect that to change as Fogarty enters his sophomore season. Fogarty and the Fighting Irish are beginning their first season in the Hockey East so Fogarty's big size will be needed especially on the penalty kill where he excels at. Fogarty also needs to have a strong season on his faceoffs as anything below a 50% win rate could be the difference between a winning season and a losing one. Adam Tambellini (3rd 65th) will be making the jump from the BCHL to North Dakota and for his development this is the right move for him. I like Tambellini's size and skill set but he has to work on his body first adding some muscle to it. Better body to me will help Tambellini improve his decision making speed. There is no question that Tambellini can score but let us see him put the entire package together. Anthony Duclair (3rd 80th) should have a better year now that the circus known as Patrick Roy has left the Quebec Remparts. Duclair had a rocky season last year and should bounce back under new coach Philippe Boucher. Anything less that 30 goals will be unacceptable from Duclair who has speed and talent but needs to show that he will bring it every night. Ryan Graves (4th 110th) plays on a team called the Islanders which should make things confusing for several Ranger fans. What won't be confusing is that Graves at 6'4 220 as he will be looked to lead a very young Charlottetown Islander blueline. Graves will be asked to play top 2 minutes for the Islanders who will be coached by former Ranger Gordie Dwyer. Mackenzie Skapski (6th 170th) is in my book the prospect to watch as the goalie for the Kootenay Ice will be asked to carry the Ice on his shoulders once again. Skapski appeared in 65 games last season going 34-25-1 with a 2.78 GAA and 0.910 save percentage. Would like to see Skapski come down to a 2.25- 2.30 and 0.925 for this season. Troy Donnay (2013) is a player who in all honesty I am wondering what the Rangers see in that nobody else did besides being 6'7. Yes he has a lot of size but in watching him last season, Donnay doesn't always use it. He doesn't have any real offense to speak of and he is as expected a major project. I just don't see Donnay as NHL material unless Jeff Beukeboom is a miracle worker. I have been a Pete's for a long time. Yogan is the real deal... It was mentioned this past week that Yogan forgets he has other linesmen... Uninformed comment on the blogger's part... I watch EVERY game and Yogan dishes the puck all the time and the number of assists illustrates my point. Due to injuries The Pete's are extremely young and Yogan must take more shots for The Pete's to have a chance. Furthermore, Yogan's work away from the puck is rarely mentioned. Since he has joined The Pete's I see a big kid, that has very deceptive speed, great hands, and he playes with alot of fire in his gut. Not to mention that he is a great citizen... Come to Peterborough and ask around town. If he gets his contract Peterborough will miss him! I have to step up with my man Irish&Hungry. We have been attending Pete's games together for almost 2 decades. We are not sure where the negative comments about Yogan originate from, but they are much different from we witness up here. When Yogan scores it is typically of the "statement" variety. The coast to coast goal against London was Bobby Orr like. It is funny because you yanks never called Jordan selfish & nobody ever said that Gretzky forgot he had linesmen. The Pete's have five 16 yr olds on the ice. Yogan is just taking the mantle like an overager should. There is alot of talent on the defensive side that have been injured for The Pete's, and Watson got dealt. If The Pete's had Puempel and Koekkoek combined with the former this blog would be singing a different tune about Yogi Bear. You should talk to Brian Drumm and ask him his opinion. He was skeptical at first and has become a believer. I am interested in information about Jesper Fasth. Was reading great things about this swedish kid and then he suffered a terrible leg Fracture. But, it seems as if he has recovered and is playing again? Any news aout Jesper? Only information I have had is that he is fully recovered and is playing again for HV71 in their playoffs.